Lennox® Products | JCD Refrigeration Inc.
Want to benefit from Lennox® heat pumps’ exacting precision? It’s your lucky day because JCD Refrigeration Inc. has a wide selection of units, which classify among the quietest and most energy-efficient on the market. We also sell air handlers and mini-split systems. Take a look at the available models, and Contact us today to learn more about our products. 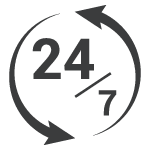 We’re located in Montreal and are open a 24/7.